The Univision news team of reporters and talking heads seem to be in a tailspin trying to make sense from the fact that 60% of the nation's Hispanic voters vote for Democrats, and yet the only three Hispanic winners of state wide offices and all of the new Hispanic Representatives are all Republican. It's funny listening to them trying to force a square peg into a round hole. Not me, but my actress daughter Elise... check her out on Seattle TV here. The Corcoran Gallery of Art and College of Art + Design will serve as FotoWeek Central, the hub of activity during FotoWeek DC 2010 (November 6 – 13). Activities include the official launch party November 5, expert portfolio reviews, NightGallery projections on the museum’s historic Beaux Arts exterior, and a variety of workshops, tours, and lectures—including an evening lecture, photo presentation and book signing by Restrepo co-director and producer Tim Hetherington at 7 p.m. on November 11. Hetherington’s new book of work, Infidel, is as much about love and male vulnerability as it is about bravery and war. In celebration of FotoWeek DC, the Corcoran will open its doors Monday and Tuesday from 10 a.m. – 5 p.m. of the festival and will be FREE and open to the public for the duration of the festival. To see a full list of FotoWeek Central activities, visit www.corcoran.org/fotoweekdc. The very young and superbly talented DMV area artist Teresa Oaxaca of Arlington, Virginia will show new paintings in the Rotunda of the Carnegie Institution in Washington, D.C. in connection with the Esperanza Education Fund’s Benefit Concert on December 6, 2010, 7:30-9:00 PM. This young 22-year old painter Teresa Oaxaca is a classically trained painter who grew up in Arlington. She studied for five years in Florence, Italy, and currently works in the Washington D.C. area as a full-time artist. Her portfolio largely consists of figural painting and still life although she is also known as a portrait artist and has been taking on numerous commissions from clients in the Washington D.C. area since 2006. 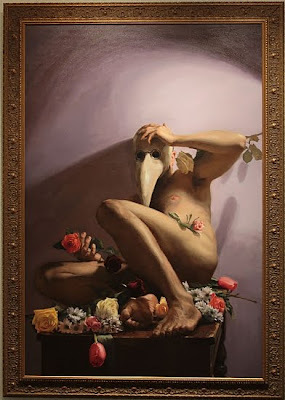 This young art prodigy has already received high recognition, including winning international awards such as the Canadian-based (and highly contested) Elizabeth Greenshield Foundation grant twice, apprenticing with the uberstar Norwegian painter Odd Nerdrum, and exhibiting internationally. Keep your eye on Oaxaca.